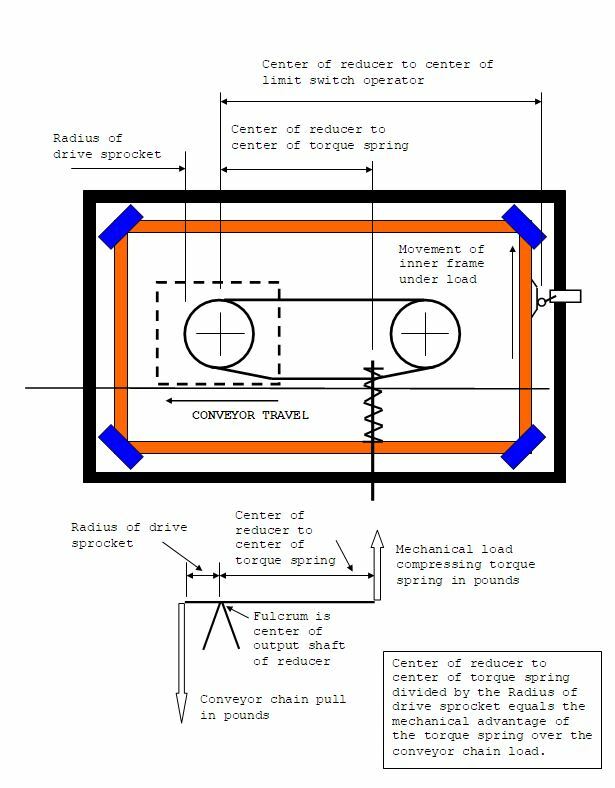 Setting the Torque Spring on a Rotary Drive - Automatic Systems, Inc.
Procedure for setting the torque spring on an Automatic Systems Inc. rotary drive. The torque spring should first be loosened until the inner frame of the drive starts to “bounce” under load. The “bouncing” is the rotary movement, of the inner drive frame, associated with the changes in the conveyor power chain load. (The fully relaxed dimension of the spring is twelve inches.) Then the spring should be compressed just enough to keep the drive from “bouncing” when it is under normal load. This should be done gradually and if possible check it when the conveyor is running with its maximum production load. If the torque spring is to tightly pre-compressed by the lock nuts the drive would have a tendency to shear a pin before the inner frame would move enough to strike the torque limit switch. Now look at the association of the limit switch striker plate, on the floating frame, to the torque overload limit switch mounted on the fixed frame. When the drive is running with a normal load an additional 1000 pounds (GM’s CS-1 spec. recommends that the six inch drive torque out at this point) of chain pull should move the floating frame to where it will operate the torque limit switch. The torque spring, on a 6-inch rotary drive, requires 400 pounds to compress the spring one inch (240 pounds to compress the spring one inch on a 4 inch drive). The drive sprocket is a 19 tooth and the caterpillar chain is 2 inch pitch. The pitch diameter of the sprocket is 12.152 inches, so the distance from the center of the reducer shaft to the centerline of the caterpillar chain is 6.076 inches. The distance from the center of the reducer shaft to the centerline of the torque spring is about 2’-11”. Divide 2’-11” by 6.076” and you have a mechanical advantage of about 5.76 to one. With an additional 1000 pounds of chain pull on the conveyor power chain the torque spring would have——1000 divided by 5.76 (mechanical advantage)——174 pounds trying to compress it. Divide 174 by 400 (the number of pounds to compress the spring one inch) and you find that the spring would compress .44 inches with an additional 1000 pounds of conveyor chain pull. The torque limit switch is about 5’-3” from the center of the reducer shaft. When you divide the 5’ -3 “by 2’ -11”, you have a ratio of 1.8 to one. Therefore, if the torque spring compresses .44 inches, with an additional 1000 pounds of conveyor chain pull, the torque limit striker bar will move 1.8 times that dimension or .78 inches (about 3/4 of an inch). The torque limit switch should then be set where the limit switch will be operated with 3/4” of movement in the inner drive frame. The setting of the torque limit must be made with consideration given to the starting load of the particular conveyor. This is so the torque limit is not tripped on startup of the drive. If the physical dimensions on the drive frame being checked vary from those described above, adjust the mathematics accordingly.